growing hope | bahá'í children's class ideas! Many of the children in our neighbourhood class come from families who fled conflict in Myanmar (Burma) many years ago, having spent several years of their young lives in refugee camps before arriving in Canada. 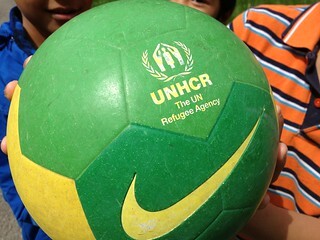 We tend to forget this sometimes when we teach the class, until they bring out the football with the UNHCR logo and start kicking it around—a symbol of a troubled past that echoes into the present. That’s why I was shocked the very first time we offered a class on kindness, and heard one of the older children—one who only occasionally attended the class—say that he could never be kind to a Burmese. Why not, I asked? “Because they killed my family,” he replied. He had seen loved ones shot and killed before his eyes. How could he treat their killers with kindness? As I fell into a speechless silence, trying to find a way to respond, it seemed like the entire lesson fell apart in my mind. From my comfortable, sheltered vantage point as one who had never known war, loss and destitution, I had never considered how to respond to the needs of children who had endured that kind of suffering. Many of our children, thankfully, are too young to have witnessed much of this violence themselves; they were born in the camps, after their families had already fled the conflict. But all of them have older siblings and cousins, some of whom were approaching the age of junior youth. At one point, as we were meeting together to reflect upon the neighbourhood’s progress, it became obvious to us that we should try to engage them by inviting them to form a junior youth empowerment group. Now, usually we would start a new group with the book Breezes of Confirmation, because its content is most appropriate as an introduction to the program—a lower reading level, and simpler exercises that serve as a stepping stone to more complex ones in further books. But knowing the families we were involved with, and hoping to find ways to address what we saw as an important issue in their lives, we decided to experiment with another book, entitled Glimmerings of Hope. In Glimmerings of Hope, we read about the story of Kibomi, a young boy who believes he can make a difference. Kibomi lives in a country full of strife, and one day, his parents are killed in front of his eyes by soldiers of another tribe. He runs for his life, and along the way, as he struggles to come to terms with the horrors he has just seen, he meets many people: a terrified child of his own tribe who has been driven to join a rebel army; children of the other tribe whose parents have also been killed; an old man of the other tribe who shows him kindness instead of hatred, sharing his food and shelter with him; and so on. The people he meets help him to see he has a choice: either to sink into despair, rage, violence and revenge, or to turn his suffering into fuel that will help him change the lives of those around him for the better. Doing the latter takes strength of character that he’s not sure he has, but as he meets more and more people who are working hard to build bonds of loving-kindness and unity between the warring tribes, he realizes that he can draw on their strength to build up his own. Eventually his feelings of fear and despair fade away, and he makes his choice—to work actively towards the betterment of the world. Even in our children’s class, we manage to address the subject when it comes up, although in simpler terms. The children do seem to understand when we explain that we have a choice to treat people kindly or unkindly, and that there are consequences to either choice. When we treat others unkindly, they’re more likely to treat us unkindly, and vice-versa. 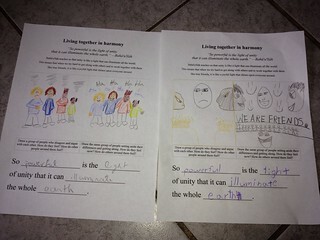 The lessons in Set 4 of Ruhi Book 3’s Grade 2 curriculum, on the topic of living together in harmony and unity, were especially good for addressing this issue. It’s not always easy to tell if they’re really getting it, but their parents have told us that they’ve seen a definite improvement in their behaviour over the past year. One of the fathers said that he noticed his son was getting into fewer fights, and working things out using words instead—a sign that something’s working for sure. As teachers of Bahá’í children’s classes and animators of junior youth groups, we’re engaged in an educational process that spans entire lifetimes. The time we have with these young people is short, but more often than not, it’s enough to make a big difference in their lives. Will these short years remove the trauma of losing loved ones, or erase the memories of violence and conflict? Not likely. All we can really do is offer tools that will help young souls to deal with their reality, and to regain hope and trust. As we do, we forge bonds of friendship with them and their families, getting to know them closely, like members of our own family. We learn from them, coming to understand who they are, what they’ve been through, how to serve them better, and how to help them arise in turn to serve others. This entry was posted in experience and tagged harmony, hope, kindness by dan. Bookmark the permalink.